Mathura, was originally, and is still revered as, Braj Bhumi, or the Land of Eternal Love. The name was bequeathed to Mathura because Lord Krishna is said to have spent his childhood and adolescent years here. His Raas Leela with the gopis are well entrenched in the Hindu psyche and have been immortalised in the temples, bhajans, arts and paintings. In fact, many of the Hindu art forms find their roots here. The place was considered to be a myth till it was rediscovered in the 16th century, in and around Mathura. Today, Mathura is one of the most important pilgrimage centres of the Hindus boasting innumerable temples dedicated to Lord Krishna and his consort Radha. However, before the city gave way to Hinduism in the 8th century, it was a Buddhist centre with several monasteries housing more than 3000 monks. However, most of these centres were destroyed by the Afghan warlord by the name of Mahmud Ghazni. Much later, it was Aurangzeb, in the 16th century, who levelled down many of the famous temples including the Kesava Deo Temple and had a mosque built there in its place. 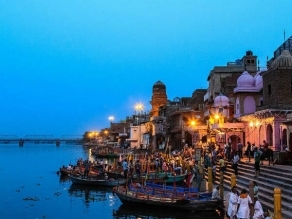 Mathura continues to draw a flood of pilgrims all year round and especially during festivals, such as Holi and Janmashtmi (Lord Krishna’s birthday), which falls in August/September. Situated on the banks of river Yamuna, Mathura is seen as the cradle of Indian culture and civilisation. India is considered to be a spiritual destination and many of the visitors looking for peace and enlightenment head to the city to seek solace in its ashrams and temples. Mathura is considered sacred by Hindus, Buddhists and Jains. 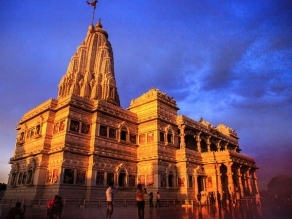 Shri Krishna Janmabhoomi Temple, or the birthplace of Lord Krishna, is one the most sacred temples located here. In fact, most attractions in Mathura have some connection with Krishna. Another case point is Vishram Ghat, where he is believed to have rested for some time before going on to slay his, mama, or maternal uncle, the tyrant Kansa. The Dwarkadheesh Temple is the main temple which is decorated on a grandiose scale during Hindu festivals, such as Holi and Janmashtami. 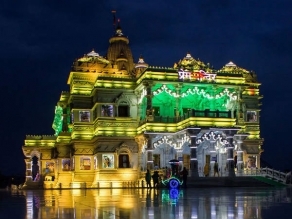 Gita Mandir, on the outskirts of the town, showcases temple carvings and paintings. The Muslim population finds representation in the Jama Masjid which was built in 1661 AD. The Government Museum, located at Dampier Park, boasts of one of the finest collections of items of historical and archaeological interest including rare findings from the Gupta and Kushan period (400 BC to 1200 AD). Besides the above, other attractions worth a mention include Kans Qila, Potara Kund and the Ghats of Mathura. A visit to Mathura can be combined with a trip to the neighbouring pilgrimage town of Vrindavan. Mathura is well connected by road, rail and air. As with the rest of North India, the ideal time to visit Mathura is from November to March when the weather is extremely pleasant. Bus services are available from major cities such as Delhi, Allahabad, and Agra. State owned transport corporation runs regular buses to the city. Deluxe buses and Volvo services are also available. The Mathura railway station is an important junction for trains from major Indian cities like Delhi, Mumbai and Chennai. Regular trains that connect Mathura to other cities are Delhi to Mathura Shatabadi Express, Kolkata Toofan Express, and Chennai GT Express. The nearest airport is the Delhi airport which is about 170 kilometres away from Mathura. You can hire a private taxi, or opt for deluxe buses or Volvos to travel to Mathura. The travel time by road is about 3 hours, depending on traffic.